You'll love your skin with a crystal-free microdermabrasion or HydraFacial serum rejuvinating treatment. 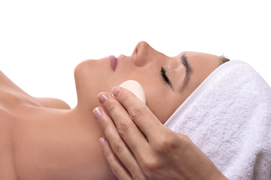 We offer Microdermabrasion with a crystal-free system which will feel soothing and relaxing. We will help exfoliate outer cells making up the Stratum Corneum, which acts like a lamp shade to dull the beauty coming from your skin. No pain- just gain. We'll see to it. HydraFacial™ combines the “Power of Three” to give you beautiful, vibrant skin without harsh chemicals. Salicylic acid and Glycolic acid, Vitamin C and Papaya Enzyme peels are available.